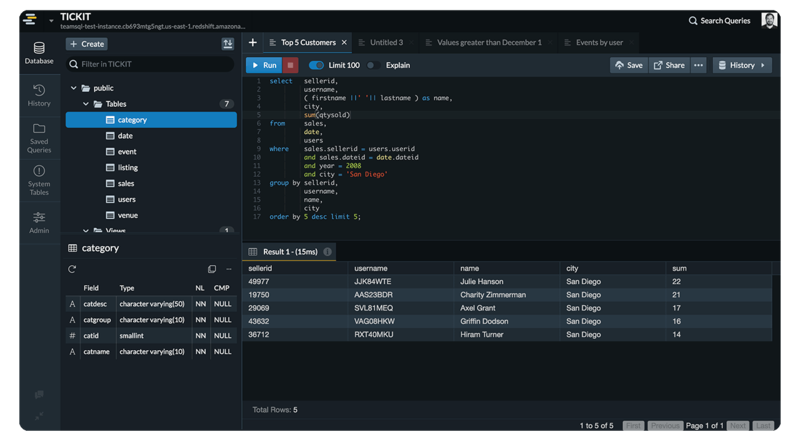 Regardless of whether you're working with Oracle, MySQL, Microsoft SQL Server, PostgreSQL, AWS Redshift, Redis, Amazon Aurora, MariaDB or CitusData, you can use TeamSQL's powerful search functionality to find what you need. TeamSQL's search functionality isn't limited to just your query history. You can search through tables, stored procedures, views, functions, and more. Launch the search option using CMD + SHIFT + F (macOS) or CTRL + SHIFT + F (Windows/Linux). listed in the navigation area to the left of your query execution window and data grid. There are numerous shortcuts that allow you to perform actions faster.